Spinel gets its name from the Latin work "spina" meaning arrow. It can be found in many different colors including Red, Blue, grey and colorless. The crystal structure of Spinel is Octahedra also called twin pyramid. As you can see on the picture, its crystals looks like two 4 sided pyramids back to back. 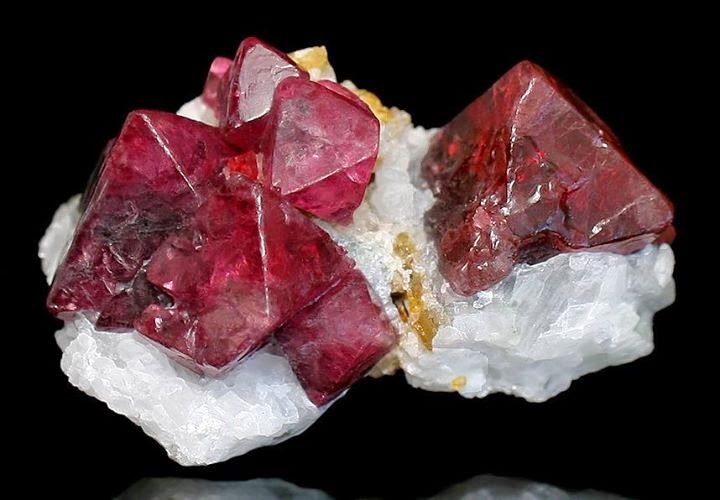 Until recently and the progress of gem identification, it has been mistaken for other gemstones like Ruby in its red form or Sapphire in its blue variation. This has led to many ancien spinel being called ruby like the famous "Black Prince's Ruby" spinel in the British Crown Jewels. Spinel's hardness in the Mohs scale is 8 which makes it a very durable stone suitable for any type of jewelry.